For the past month I have been playing Florence Nightingale as the males in my house have been dropping like flies. Lewis had swine flu badly enough that he wasn't vertical for days and out of work for over a week. The boys have had fevers and other symptoms one day been fine for a week and then symptoms again. Because of the swine flu the school district has sent home guidelines that children should not return to school until they have had 24 hours without a fever of 100° or higher. Once their fever is gone my children are back to their usual energy and whining levels. There is little that compares to being stuck at home with pent up children. It is these moments that I question my sanity. 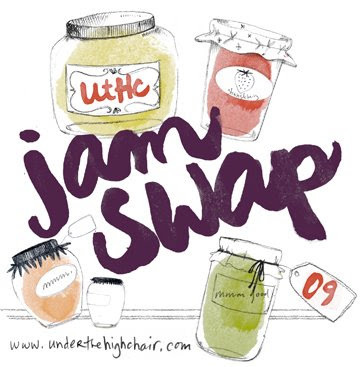 However I have found solace in reading about other bloggers jams, jellies and preserves on Under the Highchairs Virtual Jam Swap for 2009. Surely by next summer all the males here will be healthy and I can make some of these. The chickens and I have been healthy all along, but the males... If you have any canning safety questions after reading the posts (or from somewhere else) feel free to ask them in the comments section here. If you have a question someone else has the same one and may be waiting for someone else to ask. Homemade Whey, The Easy Way! !